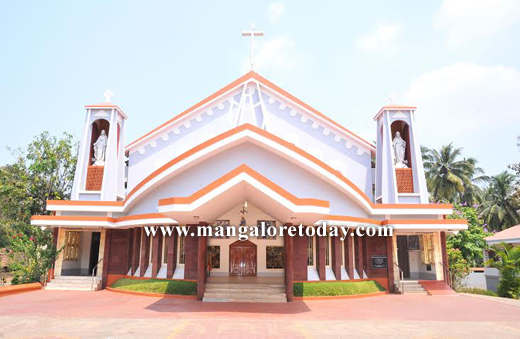 Mangaluru, Dec 12, 2015 : Urva Church to mark ’Pompei Matha’ feast on Dec 13, Sunday. According to a news release the annual festival celebrations of ’Pompeii Matha’ Church, Urva, will be held on December 13 in the presence of Mangaluru Bishop Rev. Aloysius Paul D’souza. Fr Stany Pereira, parish priest of the church addressing media on Dec 11, Friday said that annual shrine feast solemn mass will be offered Fr Victor D’mello, will deliver sermon. Pompeii Matha Church part of of the historic Immaculate Conception Church has been the divine place for the devotees in Urva and surrounding areas. Matha Maria, the mother of Jesus is called as Pompeii Matha in this form. Hundreds of people visit the holy place every day. The celebrations will start at 5.30 p.m. and the holy mass will be held in the presence of the Bishop. In the morning, a separate holy mass and prayer for the sick will be held at 10.15 a.m. Also other masses will be celebrated here. 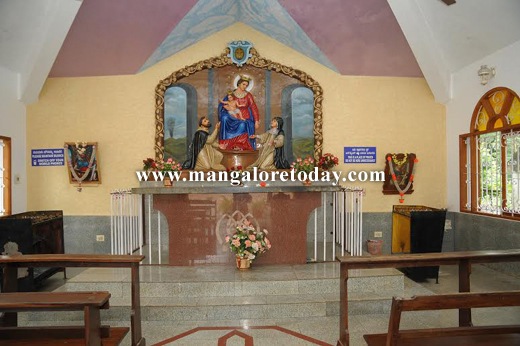 Mangaluru’s Urwa catholic parish & Pompei Matha . Coastal Karnataka’s Churches are known to be ancient and rich in history. The first parish Urwa, born from Rosario was in 1865. It has marked it’s 150th year Jubilee May 1, 2015. Rev. Fr. A. J. D’Souza served as the Vicar of this parish from 1915 to 1930 was instrumental in introducing the devotion to Our Lady of Pompei. He brought the pictures from Pompei and it was enshrined on a side altar. Thus Urwa became a place of pilgrimage for a large number of devotees from every nook and corner of Mangalore. Even though this church is dedicated to Our Lady of Immaculate Conception, quite often, people refer to it as “Pompei Church”. The annual feast of Our Lady of Pompei is celebrated with due pomp and solemnity in the month December, and throngs of devotees, from far and near, irrespective caste and creed, come with great devotion to participate in the celebration. In 1971 the northern area named ’Ashoknagar" became independent, as St.Dominic parish under the Dominican order. The popular historic spot ‘Sulthan batherry’, on the banks of the river Gupura is not far from this church. The large church edifice now seen was constructed by Late Fr John D’Souza (who recently passed away in a road accident), it’s architect being T J Lobo, it was inaugurated on May 1, 1991. Presently, it is estimated consists of around 635 families, with a total of not less than 2,300 parishioners. As a monument to the 150 year Jubilee, a majestic ’Belfry’ with new bell and ’Grotto’ is erected. Rev. Fr. A. J. D’Souza who served as the Vicar of this parish from 1915 to 1930 was instrumental in introducing the devotion to Our Lady of Pompeii. He brought the pictures of Pompeii from Rome and it was enshrined on a side altar. ThusUrwa became a place of pilgrimage for a large number of devotees from every nook and corner of Mangalore. Fr. D’Souza also started a monthly magazine, “The Trumpet Call” which won him appreciation from the Vatican it self. It must be mentioned here that even though this church is dedicated to Our Lady of Immaculate Conception, quite often, people refer to it as “Pompeii Church”. The annual feast of Our Lady of Pompeii is celebrated with due pomp and solemnity on December 8, and throngs of devotees, from far and near, irrespective of caste and creed, come with great devotion to participate in the celebration..